My father taught me to tie flies when I was about ten years of age. We tied flies for use on the coldwater lakes, ponds and rivers near where we lived in NH. The standard dry flies, wet flies and streamers served me well for all of our fishing trips. My fly tying interest waned slightly through high school and college years, but I began to tie flies more seriously after I married and relocated to Massachusetts. My dad suggested we visit an old friend to learn the intricacies of Salmon flies. I now know that once one gains proficiency in tying Salmon flies, one becomes a better tyer of many other types of flies. Jed Waterman taught me to tie Salmon flies nearly thirty years ago. I will always remember that evening when we visited Jeddy's home. I took a seat next to his desk and watched as he painted the heads of a few dozen-hair wing salmon flies. The flies were secured, by their hook points, in foam blocks awaiting the next coat of lacquer. The Green Highlanders resembled tiny soldiers assembled in formation-all perfect in proportion. The Jock Scotts were a splash of color and beauty I had never before seen. From that point on I was 'hooked'. Jed taught me to tie a Black Dose that evening. "I'm warning you, he said, tying these flies is addictive." I practiced tying hair wing flies for weeks and months. Dad gave me a copy of T.E. Pryce-Tannatt's How to Dress Salmon Flies as a Christmas gift that year. I tie most of my classic flies from the patterns in this book, first published in 1914. I recommend this book to any beginning Salmon fly tyer. More tying lessons in the art of building married wings of feathers followed from Jeddy. I received further formal instruction in the art of tying classic featherwing flies from Bill Hunter and Bob Veverka. I aspire to one day dress a fly as well as Charles Chute of Cambridge, Massachusetts. Charlie's Salmon flies are works of art and he has taught me a trick or two over the years. I live near the Nissitisitt River and have fished there for thirty years. I also like to fish in Maine and Nova Scotia. My wife and I, along with our friends, take every free weekend to paddle the waters of New England. 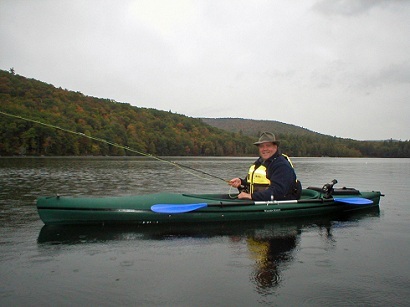 Of course, I'm never without a fly rod in the rod holder behind my kayak seat. Follow us on FACEBOOK and TWITTER. Coming soon - new online store.